Easy Zucchini, Thyme and Walnut Salad | The Mediterranean Food Co.
1. Put the oil, thyme, lemon peel and garlic in a small saucepan on a low heat and leave to infuse for eight minutes, until the oil becomes aromatic and the garlic, lemon and thyme start to colour. 2. Take off the heat, leave to cool, then strain the oil into a large bowl. Pick the leaves off the sprigs and add to the oil; discard the sprigs, lemon and garlic. 4. 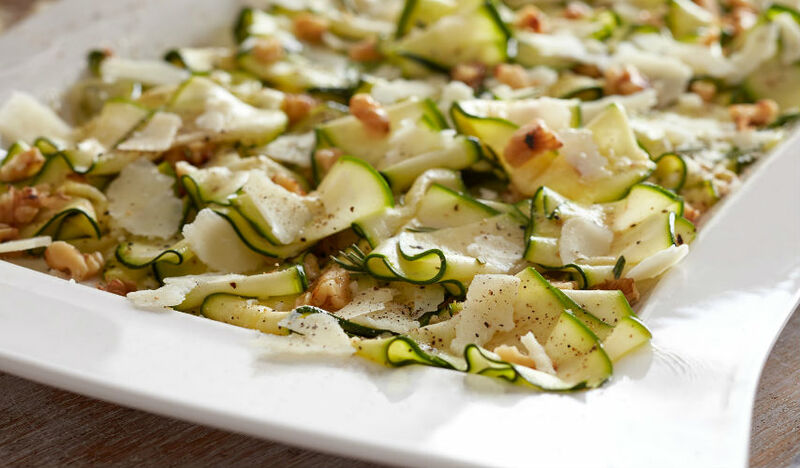 Put the courgettes, walnuts, lemon juice, a third of a teaspoon of salt and plenty of pepper into the oil, then massage the courgettes for a minute or so – they will break up a little – then stir in the shaved Parmesan and serve at once.